Welcome to ATCGbio Life Technology Inc.
ATCGbio Life Technology Inc. provides the function-validated shRNA-STK11 (Serine/threonine kinase 11) lentivirus particle. c).Lenti-Storage Solution(reconstitution) 2.0ml, shipped at room temperature, store at 4ºC. The total price for the first order is $300.00. From the second time order, the same target and control only cost $150.00. Please CONTACT US by fill-in your fist-time order number, date and contact information including name, email, phone and address. We will provide you a second order code. STK11/LKB1 gene, which encodes a member of the serine/threonine kinase family, regulates cell polarity and functions as a tumor suppressor. Mutations in STK11/LKB1 gene have been associated with Peutz-Jeghers syndrome, an autosomal dominant disorder characterized by the growth of polyps in the gastrointestinal tract, pigmented macules on the skin and mouth, and other neoplasms. Alternate transcriptional splice variants of this gene have been observed but have not been thoroughly characterized. STK11/LKB1protein up-regulates the activation of AMP-activated protein kinase (AMPK) which has been linked to energy homeostasis. ATCGbio Life Technology offers shRNA Lentivirus particle solutions which are recombinant shRNA expression lentivirus particle to be ready to infect directly for knocking-down gene of interest. It’s specifically designed for scientists who don’t have time or don’t prefer to make lentivirus by themselves. It’s the easiest way to knockdown gene of interest. shRNA-Lenti particle from ATCGbio Life Technology are created base on safer 3rd. generation recombinant lentivirus vector through our new shRNA design system; and produced by our own Lentivirus Production Kit (LT1001). Virus expresses shRNA for target gene, GFP protein and hygromycine resistance gene product. It is suitable for both cultured cells and in vivo injection to small animals. Lentivirus solution is DMEM based medium containing 2% FBS and our lentivirus precipitation/purification solution. It does not contain any chemicals used to boost lentivirus titers such as chloroquin, acetate or nicotines. The solution can be used directly to the cells growing in DMEM base medium without further precipitation/purification. There is no visible viral toxicities (e.g. change in cell morphology or/and cell detachment from culture plate) if the viral solution added up to a half amount of cell culture medium as described in table 1. Some special cells such as keratinocytes may be used to grow with special medium which is incompatible with DMEM or FBS. In such a case, it is recommended to precipitate/purify lentivirus and reconstitute it with storage solution as described in User Manual. 1. Most advanced shRNA design.No need to add polybrene.Near 100% transduction (Fig.1.). 2. High infectious efficiency(Fig.2. ), up to 0.9 x 108 TU/ml. 3. Co-express GFP protein and hygromycine resistance gene. 4. Just add and incubate overnight (16 hrs). 5. No cytotoxicity. Injectable to small animal without immonoreactive symptoms. 6. 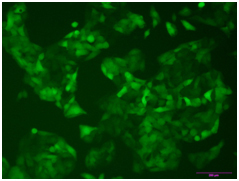 Unlike siRNA, transduced cells show knock-down effect in both dividing and nondividing cells. 7. Cell-line can be made in a week. 8. Suitable for both primary cells and transformed cells. • Virus solution can be stored at -20 °C. • Allow freezing and thawing up to 2 times. • Be stable in room temperature at least 3-4 days. • If necessary (the cells are incompatible with DMEM base medium), purification is easy as just centrifuge for 30min at 1500 × g.
Fig.1. HepG2 cells grown in 100µl MEM+10% FBS on the 96-well plate were infected with 50µl shRNA lentivirus solution 48hrs. Fig.2. 64hrs after infection without antibiotic selection, the target gene mRNAs were down to 28.8% in average of 10 shRNA targets in HepG2 cells. More details are described below. As shown in Figure 2. Ten transcription factors expressed in HepG2 cells were selected for this experiment. The lentivirus plasmids expressing shRNA were made for each target gene using our propriety design scheme (One shRNA sequence was selected for one target in each design). Lentivirus was created in 12-well plates using our Lentivirus Production kit, which produces a high titer stable lentivirus solution in 48hrs. HepG2 cells were grown in 96-well palate and infected with each virus including negative control shRNA by adding 50µl crude virus solution into HepG2 cells cultured with100µl culture medium for overnight(16hrs.). The cells were incubated further 48hrs., and harvested for Direct RT real-time PCR. As shown in the right figure, 64 hrs. 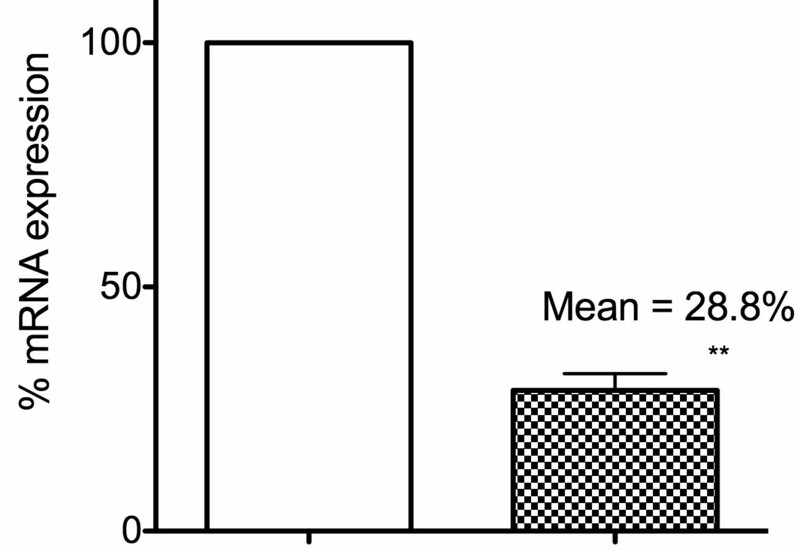 after infection, target gene mRNAs were down to 28.8% in average of 10 shRNA targets (p<0.0001 by paired t-test). 9 out of 10 design shRNA were able to suppress more than 70%, and only one out of 10 shRNA suppressed more modestly about 60%. Suppression will be greater, when the cells would be cultured longer time with antibiotics selection. © 2011 ATCGbio Life Technology Inc. All Rights Reserved.